This fascinating article in Scientific American on how immortality would affect memory would fit better in a book called Neuroscience of the Undead than Economics of the Undead. But there is a connection! From an economic perspective, the question is what incentives vampires have to invest in human capital — which may require a different name if non-humans may acquire it. It is sometimes supposed that immortals might become lazy because they lack the spur of impending death to motivate doing things. I think that is possible. But the fact that non-episodic memory doesn’t decay (much) creates an offsetting incentive for immortals to be less lazy. The longer you stand to benefit from learning something, the greater is your incentive to learn it. That’s why it makes sense for young people to attend college, but less sense for senior citizens and the terminally ill. The vampire, looking forward to a potential endless stream of returns from new learning, has a stronger incentive than the typical human to take piano lessons, acquire a new language, master a martial art, and so forth. However, even if the stream of benefits from a new skill is infinite, the value of that stream is not. 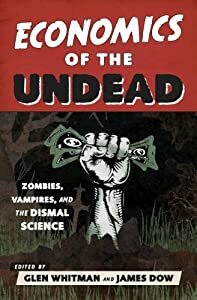 While vampires might discount the future less than humans (a subject discussed in Fabien Medvecky’s chapter in Economics of the Undead), they would probably still discount to some degree. Consequently, the perceived benefits of skills in the future — much like episodic memories of the past — diminish with distance from the present. The expected present value of the stream of benefits from a new skill would therefore be finite (see here for the math). Thus, while vampires would have a greater incentives than humans to acquire new skills, the incentives would not be infinitely great. This entry was posted on Tuesday, August 26th, 2014 at 7:49 pm	and posted in Uncategorized. You can follow any responses to this entry through the RSS 2.0 feed. « Home Economics of the Undead?